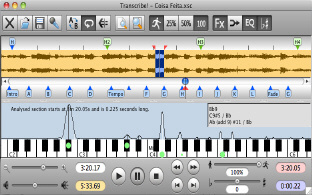 Software to help transcribe recorded music. Transcribe! for Mac is the world's leading software for helping musicians to work out music from recordings. It is also used by many people for play-along practice, and also for speech transcription. The Transcribe! application is an assistant for people who sometimes want to work out a piece of music from a recording, in order to write it out, or play it themselves, or both. It doesn't do the transcribing for you, but it is essentially a specialised player program which is optimised for the purpose of transcription. It has many transcription-specific features not found on conventional music players. Transcribe! is also used by many people for play-along practice. It can change pitch and speed instantly, and you can store and recall any number of named loops. There is some advice about this in Transcribe! 's help, under the heading "Various Topics". And it is also used for speech transcription. With its support for foot pedals and its superior slowed-down sound quality, it is an excellent choice for this purpose. Transcribe! can also display the video synchronised to the audio for some video files (on Windows & Mac, not yet Linux). Mono/Karaoke - This effect allows you to mix the two channels of a stereo recording together in various ways including phase-reverse, commonly known as "karaoke" as it sometimes has the effect of removing the vocal (if the vocal is panned dead-centre). Tuning - Adjustment to playback pitch, in cents (hundredths of a semitone) for fine tuning and also larger shifts of up to three octaves, which can for instance be useful in hearing low, murky bass parts by raising them by an octave or two. Transposition - Special handling for those of you who play a transposing instrument such as trumpet or saxophone. it capture and records all screen and sound activity on your Mac in real time. The first-ever streaming media recorder and converter for Mac! simple rhythm notation system that lets you easily transcribe rhythms. 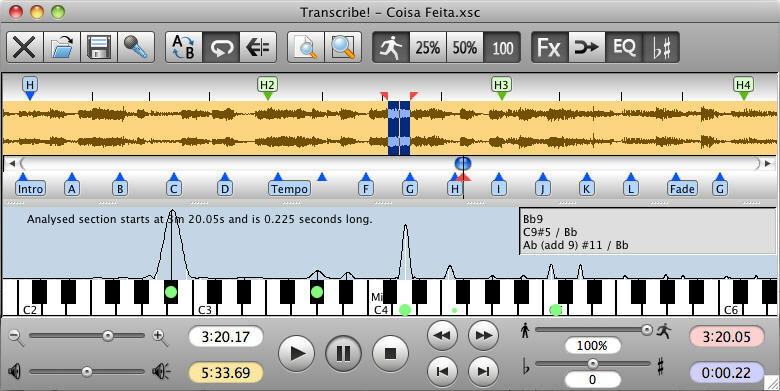 Solo Explorer is a wav to midi conversion, automatic music transcription, and notation software.